Today’s Irish Times carries my views on the immense damage that the Syriza-led government has done to the Greek economy in a short space of time. Link is here. It’s extremely unusual to find an Irish academic, particularly one so eminent, expressing such a forthright view on such a controversial matter. It is a welcome and refreshing exception to the silence or, if pushed, the inevitably weasel-worded, caveat-laden, jargon-filled, evasive and utlimately meaningless circumlocutory pronouncements of his peers. There is a consderable amount of evidence supporting Prof. Ahearne’s conclusion. Juts a few observations. 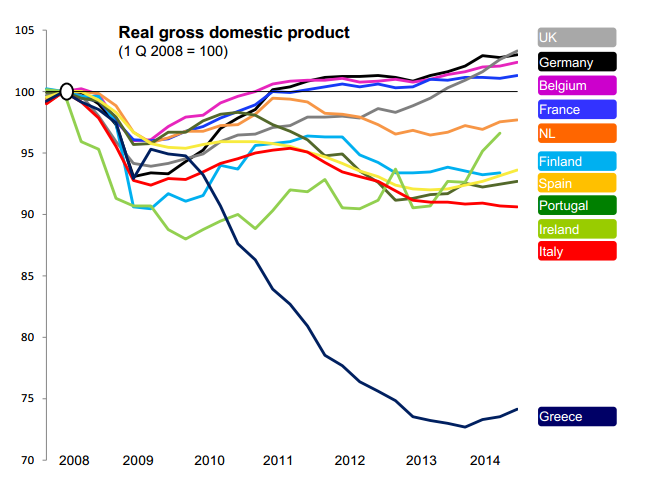 First, the 25% reduction in GDP in Greece is generally presented as the outcome of externally imposed “austerity”. It is simply the unfortunate, but inevitable, adjustment from the bubble peak. All EU economies experienced adjustments from their pre-financial crash GDP peaks. The extent of the adjustment was proportional to the extent to which they had previously inflated bubbles. However, the adjustment was managed much more equitably in Ireland, Spain and Portugal than it was in Greece. This was inevitable. Greece was, is and remains a failed state. It was the excessive inequitability of the adjustment that fuelled Syriza’s rise. But Syriza is part of the problem, not part of the solution. Secondly, it is grossly irresponsible of the external creditors to allow the servicing of the burden of debt to be imposed on those who benefitted least from it being incurred and who least able to bear it. I agree that the external creditors are not responsible for its incidence (it’s a function of Greece’s failure as a state) and have sought to reduce the burden, but they need to be honest with their citizens. Thirdly, the evident failures of the Greek state are encouraging unwarranted and disgusting back-slapping by governing politicians in Ireland and other previously vulnerable economies who were able to prevent serious failures of democratic governance derailing economic adjustment in their polities. These failings in the process of democratic governance still exist and are retarding economic recovery, maintaining the previous inequitable distribution of the fruits of recovery and storing up future problems. Many of these failings result from the excessive power and influence exercised by special interest groups. However, in most EU member-states there is a broad consensus across the centre-right and the centre-left to pander to the most influential selection of these special interest groups. This is particularly true in Ireland. And they continue to thrive at the expense of the economy and of most citizens. In Greece, there is no consensus of this nature. Instead there is a deep conflict between these special interest groups and we can see the inevitable outcome. It would be wonderful to see some analysis and forthright observations by eminent economists about the seriously damaging antics of these special interest groups, but I suspect we will wait in vain. Alan… that is a understatement if I ever heard one, but then writing in the IT one has to have a certain sense of decorum. I’ve mentioned it before on this site a number of years ago….. the Balkan mentality whilst holding a polished veneer on the outside… can contain a very hard and destructive element on the inside. I think it is ironic… that the monies borrowed over the last 30 years, some of which was spent on ‘appeasement of communists’ has now become their undoing. Greece could possibly be on the precipice of a civil war. Syriza have increased the divide between Europe and Greece, increased the divide between Greece and external creditors and not content with this level of damage… they are now going to increase the divide between Greeks themselves. By their actions you will know them…. and Syriza’s actions are nothing short of criminal. My political forecasting skills are terrible but (keeping that in mind) I believe it will be a 60-40 yes win. The masses of pensioners do not want to be receiving their monthly checks in Drachmas. They will swing the vote strongly yes, in my (very unreliable) opinion. Interesting points in above Bloomberg article. It can take up to two years to introduce a new currency. Even if the Drachma is reintroduced… the people have to have faith in it. “The key is trust in the new currency, Niedermayer said. That’s something the Czechs and Slovaks both had, and which the Greeks will surely lack. Surely the time to ensure that the country was being run right was before lending it money, not after. Klaus Regling of the ESM/EFSF on the current situation. Taking as fact , for the sake of argument, that Syriza are to blame for the present situation, European policies are in large measure to blame for creating the political context that enabled Syriza come to power. It is (to make a hyperbolic comparison) like absolving the United States of responsibility for the rise of the Mhedi Army. And the options (destroy or work with them) are the same in both cases. I disagree with most of the article. Any bailout program anywhere ever should not result in a 25% retraction in the economy. I think it’s obvious that those who crafted these string of bailouts failed. Whether for technocratic idioticy or political reasons, they failed at their jobs. Just like the creditors or those Greek banks way bank when. They failed too. Failed dramatically. They made bad bets. Bad bets that were made whole on the backs of Greek pensioners. Green shoots or not the Greek economy could not borrow. It needed yet another bailout. It had to go to the same people. It was obvious that yet again the failure of these people would be burdened by the Greek people. Hence the Greeks elected a government to end the nonsense. To my mind the government is doing exactly what it was elected to do. It seems to be the only people that hasn’t failed so far. In short the ignoring or even rewarding of these failures are the main problems here. Blaiming Greece is ridiculous. We’re lucky Hilter isn’t in power after the depression caused by the series of failed bailout programs designed by the same technocrats over and over again. Lining up to kick the bullied for following the bullies instructions. Of course the failed predictions are ignored. No one is held accountable for that. Well there’s a cost to their failures and as a European I can only hope a good chunk someday lies with those who failed. I count Ireland in that too. The state via Noonan and Kenny have been shameful during this episode of European history. Spineless bullies. I agree, we should stop any talk of further bail out. Let Greece default & exit the EU. See how Marxism works in practise. ‘So perhaps only when the Syriza government has fallen and their successor agreed to more austerity and reforms will it turn out that the Troika can after all be flexible about restructuring debt. Peter Cunningham in the FT on life without banks; in Ireland! The problem for the Greeks is twofold (i) they are no longer a society used to dealing mainly in cash and (ii) they are members of a monetary union. Jacques Delors in Le Monde (with some assistance from long-time collaborators). Maybe Ireland should have stayed “in a programme”! I am with Gregory Connor on this one. The time for visions of Europe is over. Self-interest, always the deciding force in any case, will be the key factor. If the average Greek cannot see the difference between a Drachma and a currency anchored on Germany – and the second global reserve currency – the European cause is indeed lost. The problem for anyone who puts their head above the parapet in the ‘ Great Debate on Greece’ is that they’re liable to have their head kicked in by whichever side finds their argument uncongenial to their own preferred interpretation of events. In this case, as some on twitter rushed to do. Seems to me there is nothing to argue with in the economic facts as outlined in Prof. Ahearne’s IT piece. On the politics of it, he argues that the Syriza pre-election promise of a ‘silver bullet’ solution to the woes of Greece was ill-conceived, unsupported by any plan for serious structural reform or intent to engage with the EU institutions on terms other than its own. Nothing much to argue with there either. However, in much of the public debate about the Greek crisis I think there has been too much of a focus on the way things should be rather than appreciation of what Syriza are actually trying to do in respect of an entirely separate political discourse. It is evident that Syriza envisage themselves as the vanguard of a European-wide revolutionary movement. Politically, they draw at least in part on a century- old Trotskyist-anarchist tradition of seeking to spread their message of a complete break with the established order both within, and beyond, their own national boundaries. Their achievement in one country – Greece – in facing down the oppressive international institutions of capitalism is ultimately meant to ripple throughout the entire EU. In the medium term, their political counterparts in the so-called peripheral states of Spain, Portugal and Ireland (i.e. Sinn Fein in our case) will be swept to power through popular revolt against the EU/ECB austerity straitjacket. Their political success and the social transformation that follows will, in due course, prove contagious within the politics of the remaining EU states. The ‘Syriza way’ goes beyond the revival of progressive social democratic ideals in Europe through political cosmopolitanism, as variously articulated by intellectuals such as Habermas, Zygmunt Bauman, Manuel Castells, and the late Ulrich Beck. Instead, it provides a particular form of 21st century leftwing populism. It rejects the conventions of ‘representative democracy’ as these have evolved in Europe, albeit in many fits, starts and stoppages, over the past 100 years. It capitalises on the contemporary availability of social media technologies (plus high profile interviews/op-eds internationally in mainstream media outlets) to mobilise public support over the heads of established national governments. In that respect, the Greek Finance Minister, Mr. Varoufakis, in particular, would appear to have mastered the hitherto assumed impossible feat of being in more than three places at the same time. One might have been forgiven these past weeks for thinking that Mr. Varoufakis planned to run as a candidate in our own next GE, so ubiquitous became his presence on Irish radio, TV and in newspaper op-eds and interviews. The Syriza message and method also holds a direct appeal to progressive left-wing public intellectuals, many of whom are understandably angry and disappointed at the way in which their own national governments have presided over the erosion of social welfare principles, and social justice achievements, of the past 60 years. Personally, I sympathise with their frustration; though I think in this instance they may be backing the wrong horse. First, as borne out by events of the past month, effective resolution of the issues between the leaders of the Greek government and their European counterparts become impossible (a) because their respective political visions are irreconcilable and, (b) because neither side can be reasonably expected to participate in the negotiation of their own demise. The frayed tempers, the scapegoating, the recriminations , the accusations of bad faith from both sides are predictable but ultimately unproductive. Second, as Prof. Ahearne points out, there is no evidence of any ‘plan’, either as regards its economy, or the lives and welfare of its citzens, on the part of the Greek government to cope with the consequences of the current impasse. The absence of a ‘plan’ means that the worst consequences of this debacle fall on the shoulders of the most economically weak and vulnerable citizens of Greece. That was predictable. In terms of the norms of traditional representative democracy the ‘no plan’ scenario appears inexcusable. But are those who suggest a change of government in Greece, and removal of Mr. Tsipras and Varoufakis from their current positions of power, justified? Personally, I think that decision is best left to the people who voted them into power in the first place. If the majority in tomorrow’s referendum is for ‘yes’; then resignations would seem inevitable, though given the peculiarities of the situation, by no means certain. If the vote is overwhelmingly for ‘no’, then Europe’s political leaders are going to have to adapt to dealing with a very different vision of politics, and its purpose in society, than they have encountered heretofore. One of the enduring strengths of the European project, though, lies in its concept of a union of separate, sovereign nation-states and its consequent enforced embrace of a diversity of political cultures. A Greek government led by Syriza will also need to move further towards the accepted norms of representative democracy and its exercise within a transnational institutional context. The economics clearly can, and will, be sorted out around a table; the politics – particularly for Syriza – may ultimately prove more difficult. There seems to be a real inability or unwillingness to see that this was a fault of banking. If my wife gave me money to invest and I gave it to some eejit as a loan without asking questions she’d kill me (figuratively) and not him. Banks were entrusted with money to invest and they invested it very badly. There is another problem here which is with sovereign debt itself. Essentially the sovereign is a company with an unqualified board of directors with forced shareholders (I.e. Citizens of that country) who have unlimited liability. There has been an unholy alliance between politicians wanting to buy elections and bankers willing to finance those bribes and this will continue as long as there is no default in sovereign debt. Default is the cure for what has happened. Credible reforms and running at 0 deficit is the way to prevent it in the future. Of course our instincts are not to seek solutions but to seek advantage (moral and material) and that is why we prefer to make this a national issue rather than a banking issue. A most insightful post if I may write so! However in this globally interconnected world, no nation can afford to be an Island. But Syriza have done exactly that by isolated Greece from the rest of the world. 1) USA / Canada, by road blocking resolutions on Ukraine / Russia. This has annoyed our N.American neighbours. 2) European Leaders and Finance ministers by recriminations and arguments. 3) External creditors, many of whom were left shunned twiddling their thumbs in their hotels by Varoufakis who refused to meet them. 4) Internally the Greek nation getting divided between pro / anti euro vote, which hopefully will not result in civil war. Syriza does not have a plan, there is no Rabbit going to be pulled out of any hat if Greece decides to go back to the Drachma, it does not have any Drachmas, and even if it did….nobody will hold Drachmas as they are almost valueless. Syriza clearly do not care how big the dice are that they are rolling, if it all ends in the self destruction of the Greek state and its people, they will just walk away. I can only describe Syriza in one word……they are “Gamblers” and reckless gamblers at that too. “Political vision” is overly charitable to Merkel, et al. The basic political situation, about which Alan Ahearne, as former advisor to the IMF and member of the Central Commission of the Central Bank of Ireland, predictably says nothing, is that the technocratic elites (of which he is a member) cannot admit that they got Greece very wrong. The Germans especially cannot admit this to their electorate. They’d rather bounce Greece from the euro than do that, because admitting error would seal their own fates. This article from a couple of months ago accurately explains the basic political situation, though not in any great detail, in a way that you won’t read in the mainstream press. Instead, you get former IMF advisors focussing on those feckless Greeks and ignoring the suave and sophisticated German bankers who lent them money and have been made whole at their expense. Deng Xiaoping (1904-1997) famously said in 1962: “It doesn’t matter if a cat is black or white, so long as it catches mice.” Sixteen years later he became paramount leader of China and began the first steps in the long march to restore China’s economic dominance. Last January the overthrow of the old failed Pasok/New Democracy order that misruled Greece since the restoration of democracy in 1974 seemed overdue. However it wasn’t a revolution as Syriza got 36% of the vote in a turnout of 63%. Syriza then arranged a coalition with a small right-wing party. I do agree that the Greeks should choose their own leaders but there is a naive hope that an agreement can be signed-off early in the week after Tsipras had allowed the existing bailout agreement to lapse. Varoufakis who appears to spend a lot of his time with the media, told Germany’s “Frankfurter Allgemeine Sonntagszeitung” (FAS) that regardless of which side wins the referendum, Athens would seal a deal on Monday. On Saturday Varoufakis accused creditors of trying to “terrorize” Greece into accepting additional austerity reforms. Capital controls will have to remain but absent a political agreement, the ECB will be reluctant to extend further liquidity. Varoufakis may have more time for blogging soon but with no confidence that the Greek cats are interested in catching mice, both the fat cats and smaller cats in the rest of the Euro Area will be expected to provide supplies of milk without any supervision!! There are EU haters in every member country and they will either see that as the natural order of things or in Marine Le Pen’s case a reason for both France and Greece to leave the Union. Having an external group to blame is often an excuse and according to today’s Sunday Independent, Brian Cowen will tell the banking inquiry how the ECB bounced Ireland into a rescue bailout – borrowing at 14% could have been wise after all! This will interest you while we wait for the balloon to go up. The problem with Greece is that the problem is almost uniquely Greek. achieving a reasonably melodious harmony as they sing from broadly the same hymn-sheet. The simple point is that the Euro required a quality of effective democratic goverance that few nations aee able to achieve – not to mind sustaining over long periods. Greece, Ireland and Portugal (and, to an extent, Spain and Italy) exhibited profound governance failings that exposed them to serious damage when the international financial system seized up. But all of them, with the exception of Greece, were able to muster sufficient goverance capability and to to secure a measure of public consent to manage the fiscal adjustment and some necessary reforms under the direct or indirect supervision of the Troika. This also involved pandering to powerful special interest groups which could have derailed the process of fiscal adjustment and limited reform. This pandering is damaging, dangerous and stores up problems for the future, but it was deemed necessary in the short to medium term. Greece is a failed state. Governance capability is absent and the there is a deep conflict between the powerful special interest groups and the political factions which pander to them. It doesn’t matter what external institutions do until this failure is addressed by Greek citizens. So let’s get this straight. Austerity gets used for 5+ years and craters an economy but just at the end there’s a single bright quarter. That’s success. Syzra has been in power for 6 months and hasn’t yet made the changes it promised and is therefore a failure. Colm’s article is a bit weak. First of all Greek banks might have passed stress test but since then Syrizia have collapsed economy & NPL would have gone through roof. Moreover half the capital is DTA so propects of a writedown in that are huge. In short Greek banks are now as solvent as Irish banks in 08-09 . Stock prices tell you the same. Unless the ESM recaps there will be depositor bail ins. Secondly, a debt write down by his admission would be largely symbolic & restore confidence. Would the markets not spot that one. The probability of being repaid by the Greek govt after the 8th default in history is poor. That to me is the record of a sub prime borrower so I can’t see yields coming down to reasonable levels. Lastly, reform such as it was was carried out by previous goats now defeated. Syrizia wants to re-regulate lab and product markets. In short, Greece is failing and will require more transfers from the EZ to keep the lights on. The magnitude and source of such transfers has yet to be debated or justified. This is a rather political article that plays fast and loose with facts. To say that 5 months of Syriza has caused immense damage while downplaying the 25% contraction and 60% youth unemployment that the previous 5 years of economically illiterate troika policies caused is dishonest in the least. It is also useful to recall why we are here in the first place. Both Paaok and New Democracy tries and failed to implement fully these stupid policies which have caused debt to rise to 180% of GDP. ND resigned mid term 6 months ago. Why would their return to power suddenly make things better? Doesn’t make any sense at all. If the object of your ire is the same (i.e. ECB & EU Institutions) then inevitably views will converge, irrespective of ideological leanings. Meanwhile, Syriza invited two of our own TDs to Athens – one from SF and Paul Murphy of the Socialist Party, who has since posted his vision of a ‘new departure’ for all of Europe following on the inspiration of a Syriza referendum victory…. That was a brave call – but it looks like being spectacularly wrong. “Yes” has gone to 7/2 Against on Betfair from 5/2 On this morning. The scaremongering has backfired? Who would have thunk? @The Second — Yes you are right it looks like my bold forecast was very wrong. I am surprised .. but not by my poor political forecasting, that I knew about! It is a courageous pensioner who votes to have their pension potentially swapped from euros to drachmas, so three cheers for them. A brave vote, but does it mean Grexit? Extremely interesting times.